WMHT’s project “Vietnam in a Word” caught my eye with its simple concept and its even more elegant execution: a multimedia and community-driven oral history project, realized as an attractive digital hub for all of the station’s programming related to The Vietnam War, the documentary film by Ken Burns and Lynn Novick. 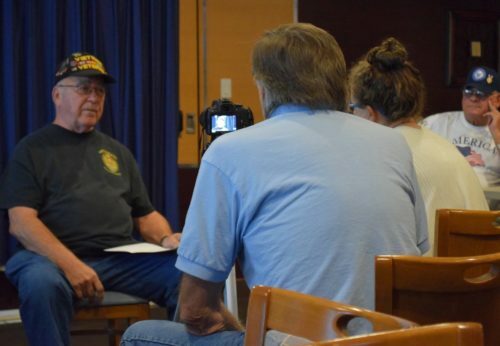 WMHT staffers interview a Vietnam veteran at the Gateway Diner in Albany. Yet WMHT’s exceptional work in its community is exactly why I was in the station’s parking lot on a biting cold day, a mile from the main road and 175 miles from my Boston home. It’s the first of what’ll be many station visits across the country for this series, In Public, in which I’ll explore the operations of innovative community engagement projects across public media. The word I'd pick is "mind-boggling." The first time I heard a group of veterans talking about it, that was the term that struck me the most. They were still trying to figure it out.